Have you heard people bragging, “Small promotional magnets are waste and they don’t contribute in advertising.” We would say such people are lazy because they have not tried to make their campaigns stand out. However, this time, you can silence them by creating simple, and impressive advertisements over small circle magnets 2.31inches. You do not need to exhibitive or extravagant to make your campaigns work, only you need to careful with the choice of words, logo, and colors. Perhaps you can take better care of logo and colors, but you should pay attention towards choice of words. Here are certain power words (which were largely used by David Ogilvy and other famous advertisers) for marketing. You can these powerful words over 2.31 inch circle magnets (as well as several other promotional mediums) to create impressive advertisements. This word generates a feeling of scarcity. It makes people to believe that they are missing something greater in life by missing the opportunity to buy your product. Who doesn’t want to save on their investments. If you see carefully, advertising format has remained the same over the years because it is quite human to target savings. People don’t want to overspend, even if they are buying an essential item. 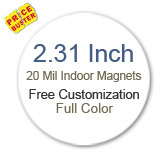 Savings and Bargain are still powerful keywords and you can easily use them over customized 2.31 inches circle magnets. At times, it may sound little bizarre, but you can still position it to promote your product or service, if it really matches to the standard of amazing. Now is a term, which generates hope and at the same time promises a better user experience. You can use it in different pretexts to push your product/service down the pipeline. Who doesn’t want to make their lives easier. Don’t you want it? Yes, everyone wants to make their lives easier. You can attempt easing the lives of customers by offering a formula or product, which meets their expectations. Don’t forget to advertise it with a backing of “Easy” wherever applicable. This might be the word, which you usually hear with job advertisements such as “a salesman wanted at Claridges” or “Wanted a photographer for our publication”, etc. You can optimize your advertisements using this word, wherever necessary. These words do have a similar effect as words new, improved, etc. You can introduce your service, product, loyalty program by backing of these powerful words. You should use this adjective wherever applicable. This term is appropriate to present a new product to the market. You can use other synonyms such as astounding, extraordinary, miraculous, etc. Only take care not to over exaggerate or overdo this term. Perhaps you know what does it mean, isn’t it? You should position your product under this headline to make it different from others. By attempting these words for your advert, you are admitting that you are human and tend to make mistakes as any other business. This “improved status” adds to your commitment to serve people better than before. Offer is a powerful word, which indicates people should grab the product before it evaporates from market shelves. It is sure that people would at least take note of your efforts to help them in savings.